Today is anniversary of the day my mother stepped out of her wheelchair and walked with Jesus. So often I wish she could hold me tight. Recently, I have needed her so much more. To my mother - Fourteen years is a long time - I miss you! THE HAT - Sunflowers mean so much to the sisters. I am fortunate I have THE HAT!! A little background about our mom. Shortly after the birth of her first child, she contracted Polio and was confined to her wheelchair until she danced with Jesus. 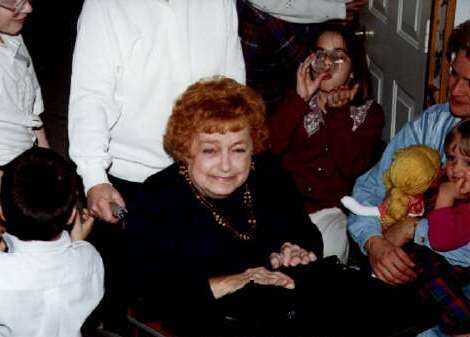 She was and will always be the mother of eight children: Gail, David, Susan, Beth, John, Paul, Jim and Amy. She cooked dinner every day, she cleaned house, washed clothes and bathed her children when they were little. She even drove a car. She taught me how to drive. There was nothing she couldn't do, but walk. She was an AMAZING woman and I failed as a child and as an adult because I didn't tell her often enough how much I appreciated the things she did for me. The last ten years of her life were filled with pain. The effects of Polio were too much for her to bear. Today, I wish I had her strength. MOM - I KNOW YOU ARE DANCING WITH JESUS, but I still miss you so. Mom surrounded by her children and grandchildren - Her 70th Surprise Birthday Party. You can tell by her tears, she felt loved. This is how my siblings shared their own Memories with Mom on her 70th birthday. I created a photo album with pictures from every sibling and their family. I believe the following is what my mom cherished the most. Included with the pictures were the following MEMORIES OF MOM. … Mom loved to lay in the sun. One day, John and Jim put her out in the sun and left. They forgot to come home to get her – well she did get quite a sunburn! … When mom held my first newborn baby, I could see and feel the pride my Mom felt which in turn, made me feel proud. … I am creative because of my Mom. I remember the messes I used to make in the kitchen when I was “into” making candles. I remember one time I poured hot wax into a plastic container and the wax melted the container and wax spilled on the counter and down onto the floor. What a mess and this didn’t seem to bother her. … One Christmas my Mom thought she was definitely going to receive a television for her bedroom – boy was she disappointed when it turned out to be a fish aquarium. … Her putting Christmas cookies under her bed so no one would eat them. Funny, the cookies still seemed to disappear. 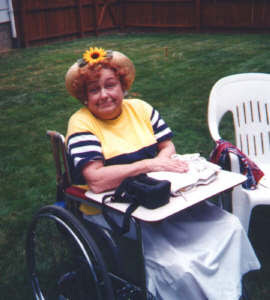 … Every night saying prayers and using her chair top as a diving board, at least three times. … Our summer vacation in a houseboat – how she was so miserable and ill. But the vacation went on. Niagara Falls, Mammoth Cave, Mystery Trips and Cedar Point. Mom also sent us on short vacation trips with Grandma Lee – Philadelphia, Niagara Falls, Washington DC, Ohio State Fair to name a few. … One early Saturday morning after fishing at Crystal Lake, I brought the fish home to show mom, she was asleep. I cleaned the fish and then took just the heads in to wake Mom up. … Mom always seemed to get in the middle of a fight and taking the punches, especially on Easter. … Her making hot chocolate on cold mornings before school. … Grocery shopping. Always afraid we would not find out first grocery cart we set back because we needed a second cart. What a nightmare it would have been if we had to shop all over again. … Shopping for school clothes. If Sue and I liked the same outfit – Sue always got it. I never got over that – she always liked Sue best. … Avoiding Mom by going up the steps when she came down the elevator and going down the steps when she came back up, it worked for awhile. … Picking off dead petunia flowers. … Being at the hospital when Michael was born. … First of all, I want my brothers and sisters to know that I was Mom’s favorite. She let me get away with so much, like the time I tore the tag off of my mattress and she didn’t turn me into the federal government. But when she did try to punish me, I would just run between the beds so she wouldn’t be able to catch me. … Now that I have my own daughter, I finally realize that all the sacrifices she made for me and my brothers and sisters. They were all made so she could see a smile on our faces. Thank you Mom! … Going to the hairdressers with her. We got to go through Sand Run Park and through the water. … Mom hated shoes laying around because her wheelchair couldn’t roll over them very well. She would throw them outside for us to retrieve. … Seasons passes to Sea World. We knew that place very well that year. … Mom with all my friends at the first and last party she let us have in high school. There must have been 14 guys around her at all times. They thought she was cool She was, she out lasted one half the boys in the game Pass Out. … The dreaded grocery shopping – 3 hours. You did whatever you could to get out of it. I even would hide in the cabinets. … Taking me back to the Gorge Park because I lost my favorite knitted scarf. She waited for me to walk the trail so that I could find it – and I did. … When I was recovering from my tonsils being removed, I remember Mom going shopping and bringing me home Colorforms, my favorite game. … In Sherwood Acres a trim on the kitchen cupboards would keep coming off because of her wheelchair. We would glue it on and the next week it would be off again. It was a never ending battle. … Playing store in Mom’s pantry. … Hearing Neil Diamond constantly and even worse – she cranked the sound up. … Lumpy Cream of Wheat. … Mom taught me how to drive. I remember her controlling the steering wheel which I pushed the pedals and visa versa. … Getting stuck in the church elevator with Mom. … Every Christmas morning was enchanting. The anticipation of seeing the gifts under the Christmas tree. … She always made sure when I came home from college on weekends, that I had food and clean clothes to take back. … Play Trivial Pursuit. She was very tough to beat. … My mom co-signed (without hesitation) my first car loan. … And Paul, just to correct you – I am her favorite! … John mopping the floor and leaving an inch of water to soak. Mom used to hate that. … Mom attended all my school programs, she chauffeured me to Girl Scouts, girlfriend’s houses, church and countless other places. I remember the many orthodontist appointments where she sat patiently in the car for up to an hour every time. … The houseboat trip where she kept a life preserver and a wrist raft on her at all times. She never got out of her pajamas the whole time. … Going to the grocery store. Click’s for two hours almost every week. She couldn’t go up the aisle of food, we always went down. She said it was too confusing, so we had to back up and go down each aisle the same way. … Caleb loves Mom so much he calls my house boring and Mom’s trailer fun. He wants to go and stay there all the time, she must spoil him; of course – she always favored boys.! … When I was little I loved staying home from school because I was sick and laying in her bed watching TV while I got pampered. … Contact papering her tray. … Mom asking me to sleep with her in Sherwood Acres and she would turn and take up the whole bed and make me sleep across the bottom of the bed. … Mom was always at home when we got home for school. No one was ever left alone in our house. … The best; getting between the beds where she could not reach me and laughing. The worse getting caught with nowhere to go and having no choice but to hold the hands out for a slap. … We had to go to as many county fairs as possible every summer. … Painting baseboards in Sherwood Acres. … Mom turning the stereos up to 10 in the whole house. … How she took care of Sabby, Pluribus and Taffy. Always said excuse me to them she needed them to move. … Mom hiding my clothes when I left them lying on the bedroom floor. … How fast she could move, when she was after something. She was like a car speeding down the halls. You had to run or get out of the way. … Mom’s junk drawer was a true junk drawer. You could find everything in it, but it was very messy. … Shopping at O’Neil’s, the Georgian Restaurant and the special ice cream dessert. I remember driving all the way to the new Summit Mall, it seemed so far away! So was the Hartville Flea Market. … Making cookies, coloring Easter eggs and how much fun she made it. … Playing in the elevator.